You can have even the most powerful motorcycle battery but it’s not going to be of any use if you have a flat tire. If this is something that happens quite often, you can find more info here about a plethora of things that keep you safe in case of an accident. 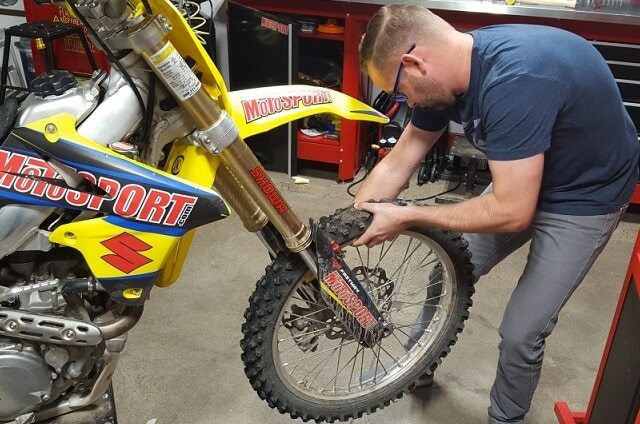 Since we want you to be up and running as fast as possible, here’s a guide for helping you change a dirt bike tire. It’s clear that most riders and racers love that great traction feeling you get with a new tire, but almost everybody hates changing it. We’ve found that with the proper tools and the right amount of patience you can become the envy of your riding buddies by changing tires with minimal effort and even without bloody knuckles! We’ve done our research so well that this method is actually used by professional motocross staff members and they are doing great with it! The way this technique works is based on not trying to work the tube into the tire and rim after you already have one side of the tire on. The secret is starting with the tube in the tire and with enough air to keep the tube round. So let’s run through what you will need to do this as quickly and painlessly as possible. You need to get a dead-blow hammer, a valve stem remover, and (don’t laugh) some talk-based baby powder. When it comes to sockets, get a 12mm socket or wrench, and maybe even go for 13mm ones for Euro bikes. After you have that, secure at least two tire spoons but if you can get three, that’s even better. A Bead Buddy will also be required as well as tire paste, pressure gauge and, Lord help us, a good tire stand. While you don’t absolutely need one to get the job done, having one makes it a lot easier. Another tip is to wear good work gloves to help your grip and avoid bloody knuckles. Go ahead and start with the sprocket side of the wheel facing up. You have to remove the valve core completely to make sure the tub has no air left in it. If you don’t have a tire stand, improvise a pad from a square of suitable material, like a carpet, to help you in protecting the disk and sprocket from any ground damage. Go ahead and loosen the rim lock nut until it’s holding on for dear life to a couple of threads. If the nut feels like it bounds on the threads in any sense of the word, make sure to use grease or anti-seize on the threads to avoid any corrosion. After you do this, you can safely tighten up the rim lock. With the sprocket side up, make use of a tire spoon to break the bead of the old tire from the edge of the rim. Slide the bend in the iron down under the edge of the rim and use its shape and the additional leverage available to force the bead down. Use this method to work all the way around the rim. Flip the wheel to the disc side then go ahead and break the second bead all the way around the tire. After you make sure it’s completely broken, push the nut on the top of the lock bolt so you can force the rim lock into the well of the tire. By doing things this way, you will be able to break the bead loose at the rim lock. If it’s jammed in place, a flat tire iron across the top can help you. Using one hand, hold the tire bead down off the inner shoulder of the rim. While doing this, slide your spoon-style tire iron in and lever a section of the tire edge up and out of it. If you push the iron under the disc, it can help you hold it while you work in the other two levers. Continue to slowly work your way around the tire and make sure that the next tire iron is at a very short distance from the last one. About 2 inches apart should be good, but get them any closer and you will have your hands full trying to push the tire iron in between the tire and the rim. Once you got one side of the tire all the way off, pull the valve out of the rim then the tube out of the tire. If you have eaten in the past three days, it shouldn’t require more than an average physical effort. The safe way to proceed would be to reinstall the valve core as soon as you remove the tube to make sure it’s ready for reinstallation and that you won’t lose it. Flip the wheel to the sprocket side and then start dismounting the other side of the tire. What you want to do is end up with the tire on the outside of the rim. Pick the wheel up and with the rim lock on top. Bump the bottom of the tire on the ground and the rim should drop completely into the well. Your used tire will now easily push off of the rim. A decent stand will allow you to just push the tire off the bottom edge of the rim. If not, you can set the wheel on the ground and use your hands to hold the tire and push on the rim. Carefully inspect the rubber rim band and the rim lock to make sure they are in good condition and no debris or sharp edges are marked into the rim since these may lead to a tube failure. Take the talc-based baby powder and drop some in the new tire to keep it and the tube from chafing against each other. With the rim on the stand with the disc side up, insert the tube into the tire and get it as smooth as possible to ensure it’s going to be in the best condition. Add a very small amount of air into the tube to help it assume its round shape. Using a sponge, apply tire paste or a 50/50 mix of dish soap and water. Be careful not to use chemicals as they can stay slippery and cause the tire to spin once you have it on the bike. Insert the valve stem into the rim using a nut and leave it there with the nut still lightly threaded. With the tube in, now work the tire on. Take small bites with the tire spoons and the first side should be easy. When the tune ends up between the tire iron and the bead of the tire, give it a little push. 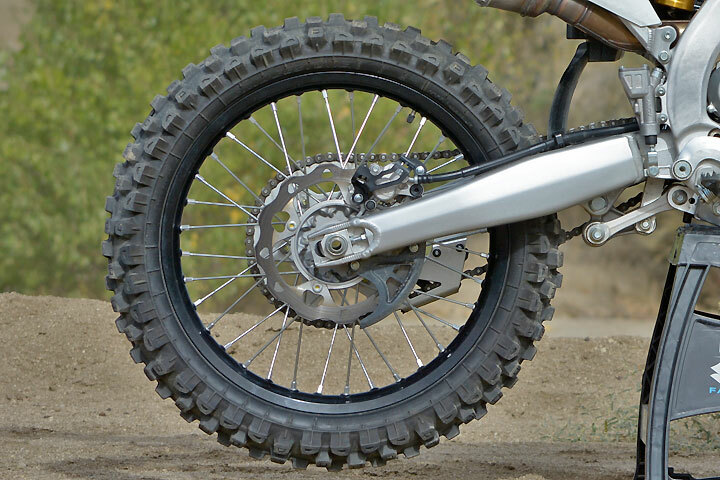 Flip the rim to the sprocket side and use two spoons to work the tire over the rim lock. Push the rim lock inside the tire but make sure its shoulders are above the tire beads. Let the tire go back into place. Turn around the wheel and tire until they are back to the disk side and use paste or soap again. Using two tire irons, insert your Bead Buddy tool to keep the tire down off the bead. Start working with small bites again by slowly introducing the tire spoons a few inches at a time. Make sure to use one hand to push down on the tire so you can keep the beads down. If you do it correctly, the last bite will be relatively easy. When you’re done, remove the Bead Buddy with a slight pry on the tire. Pressure-wise, set your tire pressure between 12-14 psi to be on the safe side. Install the valve cap but be careful not to tighten the nut down to the rim. Afterward, tighten the rim lock nut and congratulations! You’re all set to ride!